Asakusabashi is an often overlooked place in Tokyo by both tourists and residents alike. Most people will see Asakusabashi on their way to Ryogoku as it is situated just across the Sumida River from the Sumo Stadium. Due to its location, Asakusabashi is also a place that is easy to skip for all but a select few who belong to a niche market. For these people it is a place that shouldn’t be missed at all. 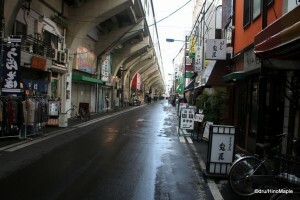 In the past, Asakusabashi was a very important area as it was one of the main crossing points between Tokyo and Chiba. People would cross over the Ryogoku Bridge that linked Asakusabashi to Ryogoku and then continued east to Chiba. 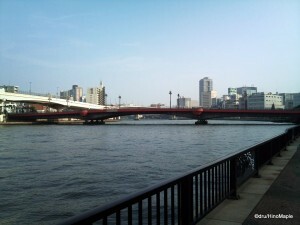 Even after the major earthquake in March 2011, Asakusabashi became important as it saw hundreds of thousands of people pass through the area as the Ryogoku Bridge is still a major crossing point along the Sumida River to get to Chiba from Tokyo. On a normal day, the section of train tracks between Asakusabashi and Ryogoku is considered the busiest section of train tracks in Tokyo but very few people ever stop in Asakusabashi. Asakusabashi’s primary business is to be a distribution area. When walking along the side streets from the Kanda River to the south as well as the area north of the station, you will find various warehouses and companies that mainly do business in importing and exporting. Of course you will be able to find a few residents as well as some schools, but for the most part the side streets away from the station are devoid of life on weekends and nights. While the area may be devoid of life at times, you can find some of the nicest small shrines in Tokyo around Asakusabashi. Going to the Sumidagawa Terrace provides beautiful views of Tokyo Sky Tree as well as decent views of Ryogoku. While the areas away from the station may not provide any interest for anyone aside for those with specific business, the station itself is surrounded by a few restaurants and izakaya. You will be hard pressed to find any high end restaurants in the area. While there are a few high end restaurants in Asakusabashi, most of the restaurants lean towards the cheap and plentiful side. You can find various major chains operating in this area such as “Sekai no Yamachan”. “Sekai no Yamachan” is a Nagoya chain of izakaya that specializes in Nagoya’s own chicken wings. There are several branches around Tokyo but the branch in Asakusabashi seems counter-intuitive till you remember that there are many distribution centres in the area and a nice cold beer and some wings are a great way to end a tough day at work. Anyone who is into arts and crafts must visit Asakusabashi. 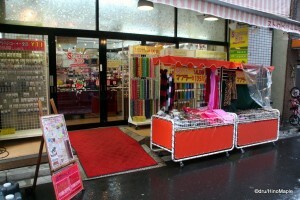 Nippori is the centre of Tokyo for fabric, and Asakusabashi is the heart of accessories for those fabrics. Asakusabashi Station is the focal point for all of these shops. Under the station itself, there are several shops, but from the east side of the station, going from the Kanda River in the south and several blocks north of the station, there are dozens of craft stores. You can purchase everything from bead accessories, lace materials, sewing thread and so on. The area changes constantly to adapt to whatever holiday is approaching. You can find decorations for Valentine’s Day, the summer, Halloween, and even Christmas depending on when you visit Asakusabashi. Prices are usually pretty cheap due to the fact that most of the shops used to be distributors. For stationary buffs and scrapbookers, you can also find various stationary items and materials for your scrapbooking needs as well. The variety of items for sale may not be as varied as some of the major stores in Tokyo but for those looking for good deals on slightly older models and bulk items Asakusabashi is a great place to go. Many of these same shops also cater to people who own a small business. A visit to the area can provide some useful materials for their company as you can purchase nearly anything necessary for a shop or even an outdoor stand at bulk rates. 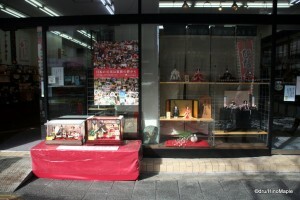 Asakusabashi is also somewhat known for selling Japanese dolls that are used for the Hinamatsuri (doll festival). These are very expensive Japanese looking dolls that are displayed in February, up to the Hinamatsuri itself. These dolls are said to provide good luck to daughters within a family and many of them are handed down through the generations. For those who need replacements or new ones, Asakusabashi is one area people can obtain new ones. While walking through Asakusabashi, I was surprised to see a doll for sale that was designed to be Darth Vader himself. You could even purchase a stormtrooper version if you wanted to. The prices were just as high as you would expect for a one of a kind Star Wars doll. The quality and craftsmanship of the doll is very impressive and worth a look for any Star Wars lover, but the price might set some people back. With these types of shops, it is very possible that you can custom order your own doll based on certain specifications, however I wouldn’t expect a miracle or a price that is reasonable. The main shops that sell these dolls have been around for generations and take great pride in their abilities. Asakusabashi is an interesting place to visit for a specific niche group of people. 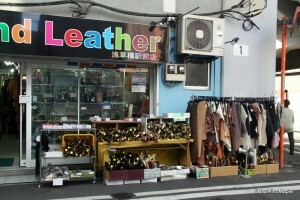 If you are into crafts of any sort, Asakusabashi is the place to go. If you aren’t into crafts, you can still have an adventure walking around the area. Seeing the commercial/distribution side of Tokyo may be of interest to you. The buildings tend to be very similar to each other and there are also several cheaper hotels and hostels around the station. You can also easily spend an extra hour or less after visiting Ryogoku to get a taste of Asakusabashi. It isn’t the most ideal location in Tokyo but it isn’t bad either. It is just one stop from Akihabara and it is an easy walk to get back to Asakusabashi if you end up partying too late and miss the last train. This entry was posted in Tokyo and tagged Asakusabashi, bead shop, craft store, doll, Fabric Town, japan, Japanese dolls, Kanda River, leather shop, Ryogoku, Ryogoku Bridge, Ryogokuhashi, Sumida River, Sumidagawa Terrace, Sumo, Sumo Stadium, tokyo, Tokyo Sky Tree by Dru. Bookmark the permalink. Asakusabashi is like heaven to me. I could shop in all those craft stores all day long, in fact I did once. My kids weren’t impressed being dragged from store to store!